This detail is from the Thomas Pride map dating from 1790, back in the stage-coach era, and before the Commons were sold off under the Enclosure Awards. Look for 'Barewood Common', 'Langley Common' and 'Toutly Common', which was on a straight track north-east from the centre of Arborfield. Look also for 'Bullmarsh Heath', which is modern-day 'Bulmershe'. 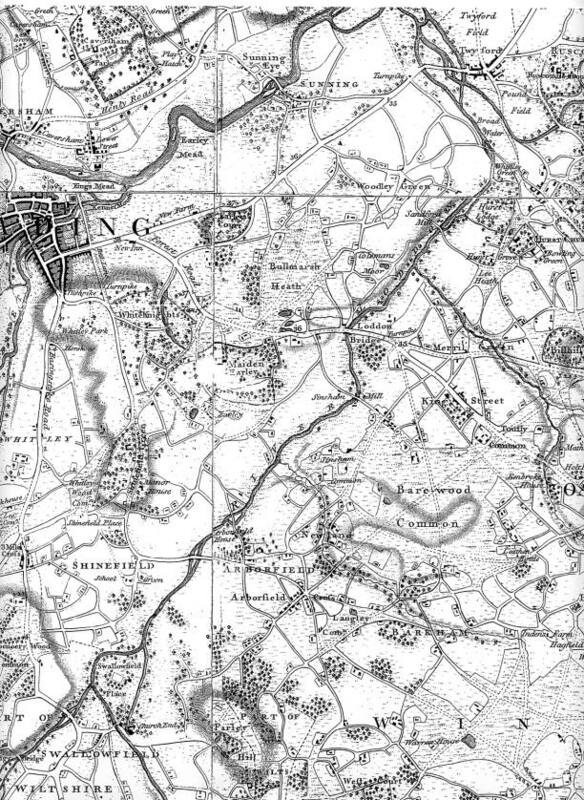 Reading's 'New Town' was not yet in existence. 'Forest Road' is now better known as the Wokingham Road. Was 'Shinefield' named after the water meadows by the River Loddon, shining in the sunlight?